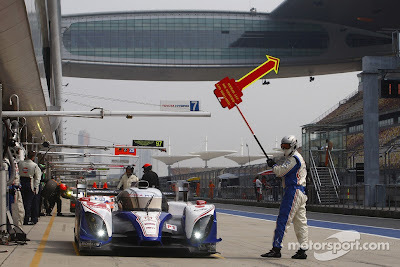 TOYOTA Racing took pole position for the final FIA World Endurance Championship race of the season, the Six Hours of Shanghai, by a narrow margin in China. Alex Wurz, who shares the #7 TS030 HYBRID with Nicolas Lapierre, recorded his best effort on his second flying lap to take pole position by exactly 0.1secs with the quickest time of the week so far. That marks TOYOTA Racing’s third pole position from six attempts in its debut season, once again illustrating the impressive performance of the TS030 HYBRID and the TOYOTA HYBRID System - Racing, which delivers 300hp of power boost. There are four hybrid recovery zones around the 5.451km Shanghai International Circuit, where the TOYOTA HYBRID System - Racing charges its super capacitor under braking prior to the release of 500kJ of energy, as limited by regulation. Conditions in qualifying were warm and dry, in contrast to the changing weather of final practice this morning when rain fell just a few minutes before the green flag. Nicolas started and alternated between wet and intermediate Michelins before Alex got his chance, switching to slick tyres and setting the quickest lap of the session, breaking the 1min 50secs barrier for the first time this week.